What Features Make “Smart” Luggage? We are currently witnessing the rapid growth of a new niche in the suitcase market. This niche is the so-called “smart luggage” market. Smart luggage is just like any other sort of “smart” product. There are tech features that are a part of the suitcase itself that really enhance the luggage and travel experience. As new entrants come into the market, we thought it would be appropriate to highlight what makes these suitcases so interesting, what sets them apart, and what you should look for if you are considering getting some for yourself. Note: We will be updating this over time as we are able to review more luggage brands. Raden has both a carry on (A22) and checked (A28) option. They have a lot of really cool features and a sleek design that we really like. 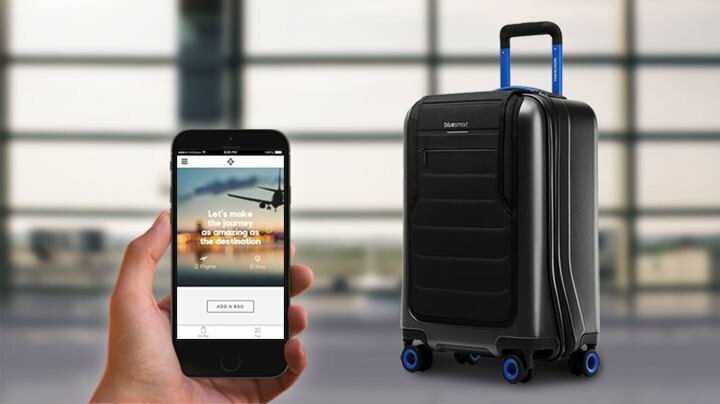 Bluesmart really made the smart luggage category go mainstream. It’s been around for some time now, so you would have the benefit of a company that has matured and tweaked its product over time. The Bluesmart is more expensive than the Raden, but the extra features will make it worthwhile for some people. This is probably most important for checked bags, but some smart luggage features a digital scale. This means you don’t need to wait until you get to the ticket counter to find out if your luggage is over the limit. Your bag will tell you how much it weighs on its own. A lot of these features aren’t critical, but they are nice to have. Some apps tied to luggage will let you know what traffic is like on your route, what the weather is like at your destination, how long the TSA line is going to be once you get to the airport, etc. You can also get a push notification if you have left your luggage behind accidentally. As time progresses, more and more features will come out and the current ones will become more advanced. If you’ve ever lost your luggage, then you know how miserable that experience can be. That’s where smart luggage can really help out. Location tracking will typically come in the form of GPS tracking or bluetooth-enabled proximity tracking. What’s the point of all these fancy features if the luggage’s battery lasts for only a short time? Luggage with a great battery is much more useful (and way less annoying to manage). If you can remove the battery and charge it, then you won’t have to plug your suitcase into the wall. If you’re always on the go, you may find your phone runs out of battery at a time where you are in transit. If that’s the case, then having USB charging on your luggage can really save you. This is obviously a non-tech feature of luggage, but no one wants to buy luggage with lots of tech features if the bag just looks strange. Having a sleek design just makes smart luggage that much more appealing. You don’t want a clunky piece of luggage that’s hard to carry or roll around. Having something that’s lightweight with a smart and easy-to-move set of wheels is absolutely ideal. Smart features are great, but if you can’t fit very many of your clothes into the suitcase, then you aren’t really getting a great value from your purchase. Some people may value some smart features over others. Other people don’t want to pay an arm and a leg for their luggage. The best smart luggage comes with a smart business model that cuts out a lot of costs to provide an awesome bag for an amazing value. Do you own any smart luggage? If so, let us know what your experience has been in the comments!